SBB – the Swiss federal railway operator – has awarded Alstom a contract worth around €115 million for the supply of four Pendolino high-speed trains. The first two trains will be delivered in 2016 and the two others in 2017. Designed to meet European interoperability standards (TSI), thanks to the Alstom Atlas signalling system, the trains will run between Milan and Geneva or Bern–Basel and between Milan and Zurich or Luzern–Basel, to cope with the increase of passengers on those lines. The Pendolino train for SBB is a seven-car train set which can accommodate up to 430 passengers at a commercial top speed of 250km/h. The train offers an excellent level of passenger accessibility and comfort thanks to, among other features, wide gangways and corridors, reclining seats, individual reading lights and electric sockets, as well as large panoramic windows. The train is equipped with the latest generation of flexible bogies reducing track and wheel wear. It also benefits from Alstom’s unique tilting technology that allows for trains to run safely at a speed 35% faster through curves on conventional lines. Designed to be eco-friendly, Pendolino is 95% recyclable and is equipped with an electric braking system enabling almost 10% reduction in energy consumption. “We are pleased to be awarded a new contract by SBB with whom we have built a strong relationship over the years. This choice demonstrates Alstom’s leadership in the high-speed sector. With its unique tilting technology and its cross-border performance, Pendolino is perfectly adapted to the SBB network,” said Andreas Knitter, Europe Senior Vice President of Alstom Transport. 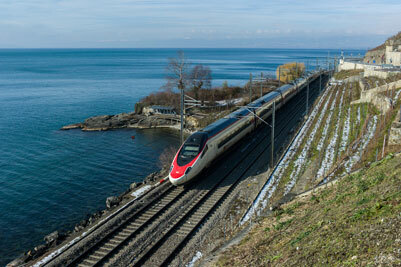 With this new order, which is exercised as an option, the total fleet of Pendolino trains owned by SBB will be 19. The trains will be made in Alstom’s Savigliano site in Italy, where Pendolino trains have been manufactured for more than 30 years. Since the launch of Alstom’s Pendolino in the 1970s, more than 500 trainsets have been sold worldwide, covering over 700 million kilometres in commercial service.